Lorrie knits and sews: First Post - Gulp! I've been reading blogs and joined Ravelry. I'm on a break from work right now, so the time has come to join the blog community. I'm also a professional dressmaker, so will post about that on occasion. Good news on Ravelry. 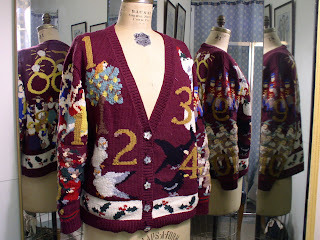 I finished the S.W.A.K 12 Days of Christmas sweater last October. I got a request today to use the photo on the Ravelry site connected with thepattern. This sweater took forever. It was a gift from DH for Christmas 1999. I seemed to only work on it after Christmas each year. I finally worked out a box and lid arrangement that made it easy to pick up where I left off. The deadline this year was our local guild member's competition in October. I've been wearing it a lot. Today is a lazy day. I'm not feeling well. DH John is snoozing and watching football on TV. I'm knitting on swatches for the TNNA (needlework trade group) Great Wall of Yarn. This is a display just outside the show, displaying the new yarns and swatches of most of them. I belong to the Association of Knitwear Designers, who knit most of the swatches. 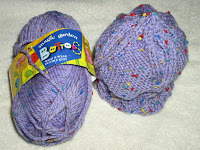 The Lilac hat is knit from Magic Gardens Buttons from Naturally Hand Knit Yarns. It is DK weight washable wool with polyester. This appears to be new color in this yarn. 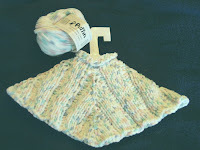 The poncho is knit from Puffin, a polyester fleece yarn from Crystal Palace. The Puffin is white with flecks of traditional baby colors. It is soft and easy to work with. Lorrie, Congratulations on the new blog. I also know the Gulp factor as I began my blog just a couple months ago when I joined the 4 socks kal. I then promptly picked up my needles and began working on totally different items for holiday gifting and have only completed one pair of socks...and they were already on the needles when I signed up. I don't post to the blog all that often either, but I do plan to get better at it. although not as far north as you.